Throughout this week we'll have a special edition of the Clan Spotlight, taking you back into the early history of Clan Wars. 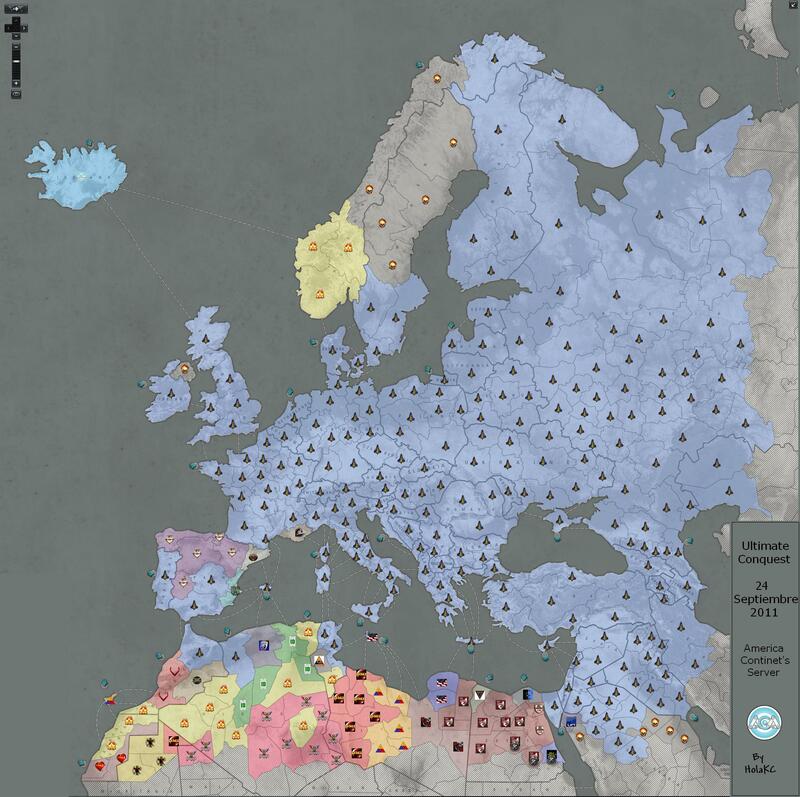 This was a time when a few Clans could hold down large portions of the Clan Wars map, when an alliance could take over 85% of the entire map's income, and then right near the end, they painted the map blue. This is the time of NASA, and we'll be bringing to you insight from some of the leadership of these Clans every day this week. The first Clan we'll visit is Forge. Seen as one of the weaker Clans in NASA at the time, they grew to possibly the most powerful Clan on the server. Despite a recent setback, they are still alive and well with a very healthy community built around the name. Yawh [FORGE] - Officer in Forge, one of the founding members. BarrooM [-G-] - A former leader of Forge. nagatron [FLCRM] - A former officer of Forge, has moved on to playing tournaments exclusively as a member of Fulcrum Gaming, the defending WGLNA champions. Discussion for all NASA Week Spotlights can be found below. BarrooM - We had just broken away from AOD and formed Forge. We were looking for a place to test ourselves and try to stay away from AOD to prevent any more drama. We started messing around in Eastern Al-Wahat (2400g province in the center of North Africa). After our merger with [CORE], we decided to try our luck over in the Middle East. There were some nice little honey pots there. The "Southern Alliance" as it was called at the time, invited us to take up some land that RS was going to give up. We jumped on the chance. We ended up actually having another clan removed from that area was well so that we could get more gold income from defending Sinai every night. nagatron - I was just starting to play actively when this happened. I believe we joined simply because we were able to lock down an LZ and earn gold with minimal risk, but I wasn't involved in that decision. BarrooM - I got to meet some really cool people. Some of the Goons were the nicest and most funny people I had met in game. When I was in AOD, Goons were painted as the evil monsters that would ruin this game. They ruin everything. I got to meet Yankee too. I can't say I really liked him at the time, but that's the great thing about this game, we've become really good e-pals. nagatron - The ability to clear each other's landing zones allowed us to have fun on our own schedule. We didn't have to defend on nights when we were really busy and we could jump into as many fights as we wanted to on the nights we weren't. Sometimes we even got to fight against allies in LZs that didn't matter. BarrooM - Greed, greed, and more greed. If we could have all just agreed to share evenly, I think you would still see a form of NASA to this day. Some clans thought they were worth a lot more than the other clans. I would have agreed that some clans deserved a bit more gold than others due to the amount of teams and quality of teams they could put out, but not the amounts they were asking for. Yawh - I don't think it really collapsed, in my opinion it more or less dissolved because there was no longer a need for it. It had built relationships that held strong enough to move forward without it. Those relationships are what defined it anyways. nagatron - Arrogance, entitlement and greed. BarrooM - Yes. It kind of already does. It's not filled with spreadsheets and hour long nightly meetings, but top clans talk to each other a lot. Yawh - Of course. The question is really who and how many would be willing to take the time and effort to make it happen. If there is a common enemy or goal it will likely happen. It is just a matter of time. nagatron - It's always possible to make something like that work, it's just exceedingly more difficult with the way Clan Wars works now. BarrooM - [-G-], Relic (all divisions indivisible under Loz), Petco, SIMP, Havok (Even though Simp and Havok are fighting the Relic bloc, I still think they should/would be included). If RS became active again, maybe those guys too. Unless something drastically happens to warrant another NASA, I don't think you will see it ever again. Yawh - I would suspect the following would; [-G-], Relic, and all of Petco. Of course they would want others to join as well but those would be the main ones. BarrooM - Watching the implosion of the clans that thought they deserved more than they were worth. Forge wasn't at its height at the time and we held our own against some of the self-proclaimed "Best Clans" in the game. After the split, I told our guys to buckle up for a tough long set of fights. One of the best things I think I've ever said during that time was "Look guys. We can lose 3 games to these guys and it won't matter. We're supposed to lose. We take 1 game from them and they will rage, they are not supposed to lose to trash like us". It really stuck. And I'm proud of how everyone in Forge at that time dug in and stuck together. Also, shout out to the old "Scrub alliance" members (SG especially). Barroom - The nightly meetings could drag on. But I think the biggest low for me was when the goons decided to join the other side. They were the swing shift clan when NASA was splitting up. They hadn't decided which side to fight on. I had the same feeling, just not as butthurt as when -G- joined the SCC war. Yawh - Meetings were long and boring, every once in a while personalities would clash, that was always amusing. nagatron - Meetings. I only had to go to a few of them, but they were incredibly long and monotonous. BarrooM - Forge was gaining a lot of rep at the time. We touted the "We're a bunch of nobody scrubs". I actually started referring to myself and Forge as "Bad@Tanks". Forge forums still has an emoticon that I created that says that. After the implosion of NASA, our rep just started going way up. We started really getting aggressive on our recruiting and battle leading. Nagatron started out as one of my "Platoon/Flank Commanders" and quickly became arguably one of the best strat and battle callers all time. Fulcrum Gaming started out mostly in Forge! Yawh - We were a force. We stood our ground and did what needed to be done. Many had little or no respect for us in the beginning and yet many of them no longer exist. Our rep was pretty much strong, proud, and respectful. We also had been known for farming an area for 2-3 months then picking up and moving to pick a fight. We liked having good fights and didn't like to farm a lot. nagatron - During NASA itself we didn't really build much of a reputation beyond the fact that we could hold a landing zone just fine and were rather friendly about clearing other LZs. Most of our reputation came after the downfall of NASA proper. BarrooM - I liked one of the proposals the Goons made. It paid the "Big Dogs" like AOD and MLP a bit more than everyone else. They had the tanks and players, they deserved it. The proposal that the AOD/MLP group made was a joke. It made me really not like a lot of those guys. It gave clans like Relic and RS 8.333k, the bare minimum share. nagatron - I can't say I remember the entire clan's stance on it, but I do remember my own. At this point I had recently become an officer and felt that each clan should be rewarded a standard amount for each LZ they held. Gold paid for work done essentially. BarrooM - There was no turning back. The power hungry were not going to change their stance, no matter what. Neither side was willing to compromise on the tiered gold system. Most of us wanted a fair share. I guess we would have had to take the lower shares in order to make it work. Funny part is, they had Forge actually making more than we had asked for, so the MLP/AOD plan actually benefited us. I just didn't like our friends having to take a hit. I personally couldn't live with that. Neither could Forge. nagatron - MLP primarily had to be willing to part with the ludicrous amount of gold they were making. The offer on the table was perfectly fair. BarrooM - I think NDP/MSW followed by SG. I really enjoyed hanging out with Chair and Hobbiton during and after the NASA meetings. Funny thing with SG; we became really close after the split, then ended up fighting later on when we were in France. Funny enough, the guys that turned their backs on us in the NASA split, NDP, we ended up trying to defend during the SCC war. We had no idea they were on the verge of dying when we stuck up for them. Yawh - I would say NDP. They had great leadership and the time. Our bond was pretty solid and we stuck with them until the end. nagatron - Havok was probably the closest thing we had to a friend. BarrooM - Everyday. A lot of the former members from both sides are now in -G-, where I am. Yawh - The lifers are still around. Some rebuilt other clans some formed new ones. The relationships are still there. They may not be as strong as they once were but they still play a role. nagatron - This has evolved over time but we worked with SG at first, then later worked much more closely with NDP, SSGS and Relic. After the split, you went with the side that was expected to lose the war, what made you do this? BarrooM - Mainly because some of our closest friends on the map were getting the short end of the stick as far as gold goes. That and I couldn't stand the egos over at MLP/AOD. I think we all wanted to stick it to them pretty badly. Yawh - Honor, Integrity, Respect. We stood by our friend and kept our word. nagatron - We had no choice really. MLP and AOD decided to start the war and felt they were better than the rest of us. We also uncovered evidence that one of these two clans was encouraging people from outside NASA to hit our LZs and were deliberately "forgetting" to clear them for us so that we'd have a harder time staying on the map. Was it surprising to you that you won the post-NASA war? BarrooM - Sort of. As you know, there is a lot of behind the scenes work that goes into these wars. A lot of forum chest puffing and propaganda. We purposely touted ourselves as awful players in an awful clan so that when and if we won, it would sting the other guys that were the best in the game. It seemed to work quite a bit. Like I said, I would gladly eat 3 losses for 1 win against them. We really didn't know at the time, but MLPs attendance had dropped pretty low. And even lower when they started losing battles. The officer core had told our members, we aren't going to stop, ever. I also think our little scrubby alliance was really well organized. We took it very serious with NASA'esque meetings nightly. Yawh - Surprising? That's a matter of perspective. We had a lot of good talent and reliable players. They were there till the end and weren't going to give up. You are only as good as your players. nagatron - Not at all. Quite frankly we knew they had better tankers on average and more experience, but we also knew that these things are only part of what wins a war. We set out to destroy their gold income, because we knew it would cause tension and create problems inside their house. I don't think any of us expected MLP to fold so quickly though. How did you grow into one of the dominant Clans after NASA dissolved even though you were considered one of the lesser clans in the alliance at the time? BarrooM - The guys believed in the clan. They believed we were just as good if not better than anyone on the map. Our recruiting standards went up after as well. We picked up some really talented callers and players. At the height of our CW ability, we had half a team of the guys that went on to form Fulcrum Gaming. Yawh - Time, effort, and a dedicated leadership. Forge will never die. This is our home for many. Sure we will have a turnover rate or drop in membership but in the end the dedicated few will always stay. We made something great and wanted to keep it great. For all those that remain we know that hardships and trials ahead. Forge will always be around big or small in world of tanks, world of airplanes possibly even world of battleships. We are a community and will take it one day at a time. nagatron - We didn't stop fighting for months. Due to a miscommunication we went to war with SSGS almost immediately after MLP fell. Shortly after that RS decided to declare war on us so we stuck around to fight that for a while until we decided to pick up entirely from that region of the map and head west. After a few-days-long campaign we stormed France and quickly established a reasonable pile of gold and began to settle down. With more free time for tournaments we joined the Absolute Power tournament and won the whole thing. This was really key for our reputation as very few clans thought we would win. After this victory we gained a lot more respect and were finally seen as a major power on the map. This was just the first of a mini-series of Spotlights on NASA Clans. For the forum discussion about this mini-series, click the button below.